The Brother DCP 7055 multifunction, monochrome laser printer is inexpensive, easy to use and produces good quality text output. The device is best suitable for office use. It’s relatively compact and lightweight. The DCP 7055 is at the entry end of the range, so you cannot expect much from it. The printer weighs approx. 9.8 kg measuring 405 x 399 x 266 mm. The design of this printer might not be so attractive, however, it is smartly assembled containing multiple features in a compact outline. The printer is narrow at the bottom offering a small footprint and gradually widens out to accommodate the flatbed scanner on the top. It has a control panel with 11 buttons and is easy to operate. The input tray is placed at the bottom of the printer which is capable of storing 250 sheets of paper. On top of the input tray, there is a single-sheet feeder which can be used for printing envelopes, labels and other print media. The Brother DCP 7055 isn’t really much to look at. However, the printer offers scanning and copying features, along with the monochrome printing capability which might fulfil the basic needs of small workgroups or home users. Brother DCP 7055 toner cartridge is also compatible with Brother DR2200 and Brother TN2010 toner cartridges. How to improve the print quality of Brother printer? The feature-packed Brother DCP 7055 printer is ideal for home and small office printing tasks. It offers high-speed USB 2.0 connection and uses Brother DCP 7055 toner cartridges as consumables. Although the printer is equipped with a wealth of impressive features and functions, it is normal to encounter some print quality issues like blurry or smeared printouts, missing colours or black printouts. Take out the drum unit and Brother DCP 7055 toner cartridge assembly. Hold the assembly and gently shake it from side to side several times to spread the toner evenly inside the cartridge. Check if the Toner Setting in Replace Toner is set to Continue. Check the machine’s environment. Conditions such as humidity, high temperatures, and so on, may cause this print fault. Turn off Toner Save mode in the machine menu settings or Toner Save mode in the printer Properties of the driver. Clean the corona wire of the drum unit: Clean the corona wire inside the drum unit by gently sliding the green tab from right to left and left to right several times. Put in a new toner cartridge: The machine will indicate when it is time to replace the Brother DCP 7055 toner cartridge. Put the new cartridge firmly into the drum unit so that it locks into place. Put in a new drum unit: Over time, the drum unit deteriorates and eventually needs to be replaced. So, replace the old drum unit with a new one and reset the drum counter settings. Once the process is completed, make a test print on the paper you inserted earlier. If still the print quality is not satisfying, we would recommend you to contact Brother support. Q. Do you have compatible drum units for Brother DCP 7055 printer? A. We currently only provide genuine and original Brother drum units for the Brother DCP 7055 printer. Q. Can you tell me what is the difference between toner and ink cartridges? A. Toner cartridges are filled with powder that may include materials like polymer, wax, carbon powder, resin, etc. Toner cartridges are used in laser printers like the Brother DCP 7055 printer while ink cartridges are designed for inkjet printers and contain liquid ink. Also, toner cartridges are comparatively cheaper since they can print more pages in relation to their cost and are better prepared to handle high volume print jobs. Q. I ordered a multipack of 2 Black compatible Brother DCP 7055 toner cartridges (TN2010). However, when my order arrived, I received just one pack of cartridges. What should I do in this situation? A. We are sorry that this event has occurred with your order. Please call us on 048 30833221 or email us at info@printerinkcartridges.ie. Please inform us within 24hrs of receipt of the goods. Unfortunately, we cannot accept claims after that time. Q. I just ordered a multipack of Brother DCP 7055 toner cartridges from this website. Is there any way I can track the order of my order from your site? A. When you have placed the order with us, you will get the unique order ID with which you can track your order with our courier company. Q. What is the maximum printing resolution supported by the Brother DCP 7055 printer? A. This printer has a maximum printing resolution of 2400 x 600 dpi (dots per inch). Q. Does a warranty come with this printer? A. Yes, the Brother DCP 7055 printer comes with a warranty card. Q. Do you provide any multipacks of Brother DCP 7055 toner cartridges? A. Yes, we have multipacks of Brother DCP 7055 toner cartridges available on our website. These are more economical to use than individual packs. Q. Is there any difference in quality between Brother DCP 7055 toner cartridges and Brother ink cartridges? A. In general, there isn’t much difference in quality when using toner cartridges and ink cartridges. Toner cartridges are used with laser printers and ink cartridges are used with inkjet printers. However, toner cartridges are comparatively cheaper since they can print more pages relative to their cost and are better prepared to handle high volume print jobs. Q. How do I replace the drum unit of my Brother DCP 7055 printer? Put the toner cartridge into the new drum unit until you hear it lock in place. Insert the new drum unit and toner cartridge assembly into the machine. Open the front cover and press "Clear". Press the "UP" arrow key to confirm that you are installing a new drum unit. When the LCD shows "Accepted", close the front cover. Q. How will I know that my Brother DCP 7055 toner cartridge is running low and requires replacement? A. You will be prompted by your printer with a message displaying "Toner Low" on the LCD screen. Make sure to keep a replacement handy so that you do not disrupt your print job. When the printer displays "Replace Toner", it means that the toner cartridge is exhausted and your print job will not continue until your replace the toner cartridge with a new one. Q. What are the dimensions of Brother DCP 7055 printers? A. Brother DCP 7055 printers measure about 405 mm in width, 399 mm in depth, 268 mm in height and weighs around 9.8 kg. Q. Do you deliver Brother DCP 7055 toner cartridges to Belfast? How long would it take for the item to be delivered? A. Yes, we provide our services all over Ireland. Usually, if you place an order before 12 noon, the product will be delivered to you within 1 - 2 days. However, if your order is urgent, you can contact us on 048 308332211 and we will try our best to deliver the product to you faster than usual. Q. I have been using my brother machine since an year now. Recently, when I print a document from the manual feed slot and found that my machine is taking more time than usual to start feeding the paper. How can I reduce the paper feeding time? A. This type of issue might occur, when you continue to print even after the LCD, LED or the status monitor shows an error message like replace the drum unit or drum is near end of its life. NOTE: The LED indications and the message displayed on the LCD or on the status monitor differ depending on the model being used with it. If you continue to print after one of the messages above appears, in order to resolve the issue, replace the drum unit with a new drum. Refer the online manual available for the instructions on how to replace the drum unit. Q. How can i get rid of the grey background while printing a document? Q. How to replace the consumable items of Brother DCP printer? A. If you start facing issues with the printer, your machine will indicate the time for the replacement of the consumable items. For replacing the Brother DCP 7055 toner cartridges and drum unit you need to follow the instructions as given in the user manual. To avoid any type of inconvenience, you should buy the spare consumable items before the machine stops printing. Q. Do you sell colour cartridges for Brother DCP 7055 printer? A. No, there are no colour cartridges available for the Brother DCP 7055 printer. 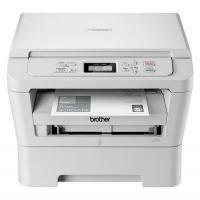 The Brother DCP 7055 is a mono laser all-in-one printer which can print only in black and white using black Brother DCP 7055 toner cartridge listed above on this page i.e. Brother TN2010 toner cartridge. Q. My toner has run out of ink, would you suggest where can I buy refill liquid toner pack for my Brother DCP 7055 printer? A. The toner is filled with powder form material that can be hazardous, so we don’t advise to refill the toner by yourself. However, we supply remanufactured Brother DCP 7055 toner cartridges that are refilled by the experts and will cost you cheaper than the original toner cartridges. A. Toner cartridges are filled with powder form materials that may include, polymer, wax, carbon powder, resin, etc. Toner cartridges are used in laser printers such as Brother DCP 7055, while ink cartridges are filled with liquid ink and are used in inkjet printers. Q. Do I need both toner cartridge and drum unit for my Brother DCP 7055 printer? How often do I need to replace them? A. Yes, your laser printer needs both a toner cartridge and a drum unit to be installed in it. However, the replacement time for both of these units depends on your printing habit. The page yield capacity for toner cartridge is 1,000 pages and for drum unit is 12,000 pages based on 5% print coverage of an A4 paper. So, if you print lot of images or take prints with more than 5% coverage, it would not provide the specified page yield. Q. How would I know which unit is to be replaced toner cartridge or drum unit for my Brother DCP 7055 printer? A. Your printer will advise you specifically that what need to be replaced. If your printer advises to replace the toner you need to replace the toner cartridge only and if it advises to replace drum unit you need to replace the drum unit only. It would be unusual that both units need to be replaced at the same time. Q. Can I use TN2220 cartridge with my Brother DCP 7055 printer? A. No, the TN2220 cartridge will not work with your Brother DCP 7055 printer model. The Brother DCP 7055 printer can only use genuine Brother TN2010 cartridge or a compatible Brother TN2010 cartridge listed above on this page. Q. Do you refill Brother DCP 7055 toner cartridges? How much will it cost? Q. I have Brother DCP 7055 printer and I use Brother TN2010 toner cartridge with it. Now the maximum page yield that I can get is only 200 pages per toner, which is very expensive. Do you have any other cartridge that can provide better page yield?